MAILCOM ’17 features five keynote presentations during its annual convention, April 10-12, 2017. (Click for Keynote descriptions, dates and times). The Top Ten Concerns of Mail Managers is the first of five keynote presentations at MAILCOM ’17 (Click for Keynote Descriptions) . Answers to the critical issues mail managers face will be featured including details on the next round of postage rate hikes in 2017. The Top Ten Concernns is one of four keynote presentations offered at MAILCOM ’17. 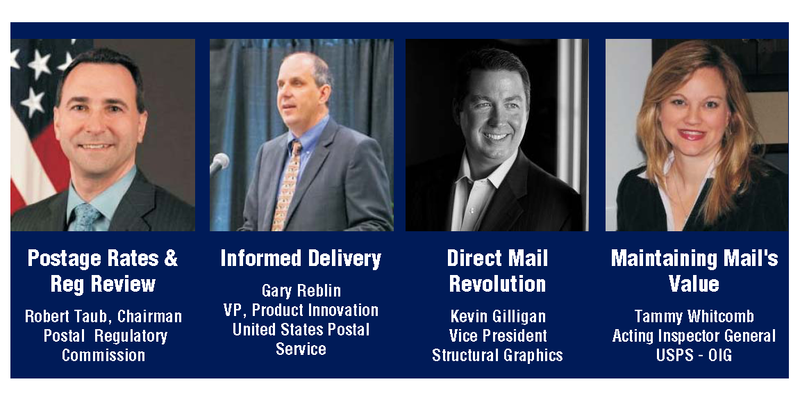 Over 100 educational sessions will be held, including a special presentation on Postal Innovations featuring Gary Reblin, USPS Vice President of Product Innovation. Reblin will also present a session on Informed Delivery and its pending roll out. Informed Delivery sends a daily email detailing the mail that will be delivered to your mailbox.